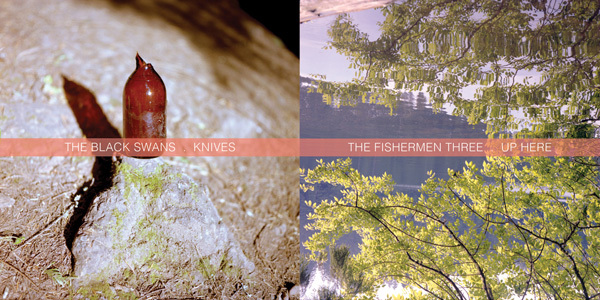 Tapes on the Floor: Album Review: The Black Swans + The Fishermen Three "Knives / Up Here"
Album Review: The Black Swans + The Fishermen Three "Knives / Up Here"
In a rare case of Midwest meets East Coast by way of the West Coast, Ohio-based folk-rockers the Black Swans have put out a new song on a split 7-inch with Brooklyn's the Fishermen Three, released by upstart Berkeley, CA label Shelved Records. The connecting tissue in this unlikely union is Raphi Gottesman, a drummer who has played with both of these bands and is now fostering his own small record label. This inaugural vinyl release suggests that Gottesman has an ear for pleasantly askew, forward-thinking artists. In their typically understated fashion, the Black Swans' contribution finds frontman Jerry DeCicca leading the group in a slow-burning track called "Knives." Harnessing a sparse, oftentimes haunting arrangement, DeCicca details the myriad uses and inherent danger of the titular cutlery in his calm, calculated drawl. If the quiet, unsettling nature of the song's opening moments acts as a proverbial stab at the listener's gut, then the chorus' major key modulation replicates the twisting of the blade. The song's sharpest moment comes as DeCicca's poignantly distills the inescapable personal quality of the age-old weapon, "You kill with a knife / You've got blood on your hands." On the other side of the record, the Fisherman Three contrast the Black Swans' grounded lament with an interstellar ode, entitled "Up Here." Singer Simon Beins takes on the guise of a solitary explorer of the final frontier, in search of an inhabitable planet and the remedy for his broken heart. The group's stark arrangement evokes the vast emptiness of space, with an inky, black acoustic strum joined by shining pinpoints of Rhodes and electric guitar. Pondering the emotional repercussions of a gravity-free environment, Beins sounds like a veritable cosmic psychoanalyst. With the avoidance sci-fi music tropes, save for a single synth-like interlude, the Fisherman Three craft a surprisingly down-to-earth track concerning post-apocalyptic life among the stars. The split 7-inch is available via Shelved Records. The Black Swans and the Fisherman Three will set out on a West Coast tour in support of the record on January 20— dates can be found here.